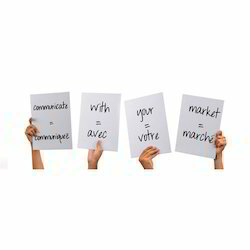 Our range of services include french translation services and french language translation services. We give French Translation Services to our significant customers. We Also Provide Other Foreign Language Translators. These Language Experts Are Well Educated Professionals Having Their Degrees From Reputed Institutes. The Language Translators In Our Team Can Easily Translate The Given Text From English To French Languages And Vice Versa. We are rendering a wide array of French Language Translation Services to our prestigious clients. We have hired a team of French language expert who has experience of this domain to execute the services within the time frame as per client's requirements. In addition to this, one can avail these services from us within the limited period of time.